I was struck by an article in The Guardian last week about lost wallets. The article reported on a recent study in which a company “dropped” 20 wallets containing £10 in cash, a photograph, tickets, receipts, stamps and several business cards in shopping centers, on public transport, in museums, cafes, and on the street in five British cities: London, Leeds, Birmingham, Cardiff and Glasgow. Only two in ten of the wallets were returned to their owners and only around half of those (55%) contained the original sum of money. The study caught my eye because I was recently one of those lucky 20%. I didn’t exactly lose my wallet, but I did lose an envelope containing 15 pounds (roughly twenty-three dollars). And here’s the kicker: the envelope didn’t have my name and address on it. All it had was a hand-scribbled note that I’d written to a woman – we’ll call her Kelly – from whom I was buying a (British) Dustbuster before she moved back to America the next day. The note read something along the lines of “To Kelly from Delia. Thanks and Good luck!,” with the cash stuffed inside. While walking to her house to pick up the Dustbuster, I’d apparently dropped the envelope on the ground along a busy London street. Because I couldn’t find the envelope when I got to her house, I assumed that I’d lost it for good and went to a bank machine to get some cash. But the next day, a stranger contacted me (and Kelly) by email to say that she’d found the envelope and because she knew that Kelly was moving (and vaguely knew that Kelly knew someone called Delia) she figured that it was us. Can you believe it? I mean, what are the chances that this woman would a. see the envelope on that particular street, which is quite commercial and heavily trafficked b. bother to read my chicken-scratch and c. return it on a hunch? Bear in mind that I’d never met her before and barely knew Kelly either. I love this story because it illustrates the humanity in all of us. (OK, in 2/5 of us.) But it’s also a great small-world story. Sometimes I really do believe the whole Six Degrees of Separation thing (even if I’m not connected to Kevin Bacon. Sniff.) A friend of mine just posted on Face Book that her son is about to go off to college and it turns out he’ll be living right down the hall from his best friend in Kindergarten (whom he hasn’t seen in 13 years.) Again, what are the odds? OK, so now it’s your turn to dish. What’s your best kindness of strangers and/or small world story? 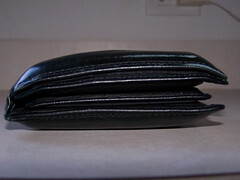 Image: Castanza Wallet by rbieber via Flickr under a Creative Commons license. When young and living in Germany my wallet with important documents and about 200 DM in it got stolen in a supermarket while I was shopping for groceries. A few weeks later the Post Office from Wetzlar, I lived in Giessen, called me and told me to come and get my wallet, which had been found in a postal collection box in Wetzlar. The money was gone, but I got my documents including identification card back. At that time I was glad that I got at least the identification paper back, now I wonder why the person chose Wetzlar where I got married. Now I feel like some other motives were behind it. Oh, I have a wonderful small world story. Last year my son started college at CU in Boulder. As it turned out, over the course of orientation, I met his roommate’s best friend from high school (in the dorm room next door to my son’s) and discovered that his mother was my roommate, my sophomore year of college. What was particularly strange was that shared space was at Indiana University in Bloomington. She had graduated the year before me and we had had no contact in the 33 years since. So two friends from a huge university lose contact and rediscover each other when their sons end up living in the same dorm in another huge university, 1200 miles and 33 years away. It’s been lovely to be back in touch and meet every few months for a meal and catch up. The discovery also made dropping off my son much easier to take — at least for the initial drive home! fabulous story Sabrina. Truly remarkable coincidence! It’s embarrassing how often I misplace, or lose, my wallet, debit card, sunglasses…..you name it. the moment in! I know, crazy lucky! I went climbing in Switzerland this summer. I climbed with a guide on a popular place for climbers – it was very busy. We went for lunch and when we walked back on the path to the rocks we met a couple who where leaving. We said hello and they said, “you didn’t forget an iPhone here earlier?” I took a look and it was mine! It must have fallen out of my backpack. It was so lucky we came back just in time to meet them before they left. Another more amazing story is about my father in law who commuted by train to work. One week he lost his phone on the train. A whole week after when he was on his way home from work a person in the seat behind him finds his mobile in his seat and ask my father in law, in front of him, if its his. And he gets it back. wow asa! amazing stories! So lucky your father in law hadn’t already bought a new one. Note to self: people who commute tend to sit in the same seats. Makes sense! Our family business is a gas station, car wash, auto repair shop and mini-mart. We see the kindness of strangers all the time. About a year ago a woman came into the mini-mart with $350.00. She was passing through town and had stopped to fill up. She says she found the money on the ground next to the pump and figured someone would be missing it shortly. It would have been so easy to just pick it up and pocket it but she didn’t. No one ever came to ask about the money and the customer was a one-timer. After a couple of months we decided to give the money to a local church who gives fuel vouchers to people who are in need. Thanks to a kind stranger several people in need were able to get some fuel for their vehicles. Cathy- I love the fact that you re-donated this “found” money to something useful. I also believe strongly in recycling good fortune. Good for you. Librarian daughter just got her first teaching assignment in a city about 2 hours away. It is only part time and she had to fly in from her Alaska summer job for the interview and then a week later quit her job and start work here. The day after she had signed all the papers, she and Principal who had hired her had to go to the district office and sign an affidavit that they did not know each other because the Principal discovered that she was a distant cousin in law to my daughter’s fellow! Because the school is a centerpiece for low income families, the district had them sign waivers so they could not be fined in the future and my daughter could keep her job. There is the most recent bit of small world in my life, and our family is so small that that never entered our minds! When I was about 10, I found a wallet on the street. My parents arranged to have it returned (it had an I.D. card and $100 in it) and when they met the guy to give it back to him, they mentioned that their 10-year-old daughter found it. He was so grateful that he gave them $10 to give to me. Turns out he was homeless and that was about all the money he had. that’s another great story, Carmen. I love it when someone in need gets their due. And the fact that he offered it back to you is amazing. P.S. Delia—I’ve been planning to tell you how much I enjoy your blog. The fact that I share a birthday with Kevin Bacon and had this story to share finally inspired me to write. Holly that is the most amazing story yet-esp the part about the gas station trusting you to come back and pay for the gas the next day. Love it! Thx so much for writing (and reading!) I was thinking abt you guys just yesterday – literally. (small world mind meld, pt 2)…. I was a college student traveling in Israel, using a bright red day-planner to organize my entire life. All the phone numbers of the people I was visiting, all my travel documents including plane tickets and passport (this was before the days of cell phones or e-tickets), and about 300 US Dollars in cash (which is a lot now but was an extraordinary sum for me at that time) were in that day-planner. I pulled it out at a pay phone to make a phone call, and somehow managed to leave it there in the phone booth. When I realized it, hours later, I was completely panicked. I asked my friend to drive me back to the phone booth, but it was no longer there. I had no idea what to do, with no identification and no money. Even finding my friends just for assistance was difficult because I didn’t have their phone numbers. An hour later a friend of mine who lived nearby got a phone call from the person who found it. This good Samaritan asked me a bunch of questions that she felt only the owner of the day-planner could answer, and once she was satisfied that I was indeed the owner she delivered it right to me. It had every single thing in perfect order, including all the cash. I tried to give her something in return, but she wouldn’t take anything. To this day, I do not know what I would have done if she hadn’t found and returned it. great story, Barb. those are the hardest things to replace! I was traveling through the USSR when I was 16 (it was the USSR then). I was part of a group of high school and college students, camping on the outskirts of each city we were touring. We were to meet up at the end of each day, to make our way back to the campgrounds. I managed to get lost in the Moscow subway system. My Russian was pretty basic, and apparently I was nowhere near where I needed to be. A gentleman saw me, asked what was wrong, tried to explain how I would get to my destination, saw my confusion, and ended up riding all the way with me, to make sure I got there safely. A kindness I’ve never forgotten. nice story. re: cat trashing lady. I posted this on FB today on precisely that topic (slow news weeks…) the country was riveted!! My husband, his niece, her husband, and I all drove from San Antonio, TX to New Orleans, LA for the Rock and Roll Half Marathon. On the way back, at the TX/LA state line, we stopped at McDonald’s for lunch. Not wanting to carry my heavy “mom” purse, I only took my small wallet inside. When I went to the bathroom, I apparently left my wallet on the TP holder. After we finished lunch, just as we were getting ready to leave, and elderly woman at the next table, asked me, “Are you Karla?” Surprised that I would run into anyone I knew so far from home, I said, “Um…yeah…why?” She handed me my wallet and said she’d found it in the bathroom. I cried then at there because 1) she saved me a lot of hassle if I’d had to replace the contents of the wallet and 2) she was the sort of person who take the trouble to find the owner and return it to me. She could easily of left it there, tossed it in the trash, or gave it to the manager–and then who knows what might have happened to it. great story, Karla. Someone once returned my wallet from an extraordinary distance and I remember it to this day. We practically cried and embraced him – a complete stranger. It really is a small world. When I was thirteen I became best friends with a girl in my class. I spent most of my time at her house and one day we were going through some old photos at her house and I found a picture from the 70’s of a group of American college students in Mexico. Also in the picture was a man with a t.v. camera filming them. One of the students looked just like my mother, so I took the picture home and showed it to her. She was shocked. She was on an anthropology class trip and the man filming them was my friend’s father who at the time worked for a t.v. station in our home town! They had no idea they had met decades before in another country. And someone just happened to snap a photo of it. now *that* is truly bizarre, sarah. also goes to the utility of photos for capturing such linkages. thanks for stopping by! Like an idiot, I once left my wallet on the back set of a cab getting out of the New York Hilton. I realized it almost immediately, and even though rush-hour traffic was at a standstill, I couldn’t find the cab on the street. I was talking to the Hilton security guards when one of the bellman walked in with my wallet. The cabbie had actually braved the traffic to come back, and then left the wallet without waiting for a reward or a thank-you. So much for the reputation of rude New Yorkers. love this story, howard. reminds me of one where the parents of my ex were on an island in the caribbean with the parents of my husband’s ex and worked out mid-way through a conversation exactly how they were connected!